My client sat back, her eyes fixed on a corner of the room but her mind fixed on the past as she described walking through a pasture and quietly contemplating how to support her family after her husband’s progressing illness forced him to quit work. “I thought to myself, What would Annie Mauk do?” – a reference to her Texan grandmother who raised about a dozen children and fed numerous farmhands and neighbors during the Great Depression. I imagine psychology expert and executive coach Caroline Adams Miller would say Annie Mauk — and her granddaughter — had “grit,” that ingredient necessary to setting and completing long-term goals by overcoming obstacles, accepting criticism and learning from failure. It’s a quality lacking among many millennials entering the workforce, Miller, author of Getting Grit (2017), told an audience yesterday at a Bethesda Chamber of Commerce event in Maryland. “Millennials have grown up with an inability to take risks,” she told the gathering of more than a hundred local small b usiness leaders. Yet “grit is now considered the key to success,”. Why don’t many of these young people take risks? Miller pointed to a world in which young people are “being forced to recognize — sometimes against their will — everyone as a winner.” Children earn trophies not for winning a competition, but for simply participating. They grow up with constant applause, grade inflation, safe spaces at colleges where they are protected from views opposing their own. “I don’t believe they’re fragile, but we’ve told them they’re fragile,” Miller said. 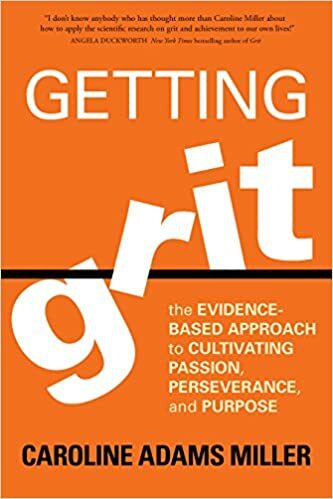 Miller’s book lists a number of steps to cultivate grit (yes, she says, it can be cultivated, in yourself and others). Among the steps are finding a passion, setting hard goals, cultivating patience, being humble, praising wisely. But Miller also encouraged the audience to cultivate grit in younger people by sharing their own stories of failure and adversity. “There is such a thing as post-traumatic success,” she said, where one finds the tenacity to move forward even after a great setback. My own sense of determination and resilience, I believe, in great measure came from my knowledge — although limited at the time — about my father’s lifelong accomplishments in the face of many hardships presented during his upbringing and later. Working with clients on their personal histories, I invariably uncover not just a list of accomplishments, but the stories of their journeys along the way. The hard road of trial and error, failure upon failure, or hard life choices that don’t always lead down the right path initially — or maybe ever — are what often make the story not just interesting, but valuable to future generations. And as I dig deeper into the client’s reasoning, typically what I uncover is their recollection of their parents or grandparents’ stories of hardship or success that inspired them to work hard. Or sometimes it’s the admiration of a favorite mentor, sibling or other family member’s journey. It’s the story of how they learned to cultivate their own grit. And it’s the story of “grit” that more and more companies want to hear from young people, Miller says in Getting Grit.